I've always enjoyed acoustic music, but I just don't have the ear or the musical imagination to really be a musician. Nonetheless, I do love playing the guitar, just wandering off into space and playing whatever comes along. I've always thought of the guitar as an accompaniment for poetry and stories, rather than the guitar music being an end in itself. Something more along the lines of Leonard Cohen, Eric Anderson or John Prine rather than Christopher Parkening. I simply can't tell an interval of a third from an interval of a fifth or a seventh. I can hear that something changed, but I am relatively clueless about exactly what the heck changed. I can eventually find it on my guitar, but it will take some hunting around. Without a musical ear, it takes me a long time to learn something simple, but it is fun. Playing my guitar is like some sort of therapy. I never have found anybody that wanted to actually listen to my playing, but it's fun for me. In the late 1980's I bought a Yamaha 4 track tape recorder so I could make some recordings and add multiple guitar parts, bass track, and make some beautiful music. Well, it didn't take me long to find out that I couldn't think of four different parts to record. On some tunes I tried two guitar parts, bass and vocals, but that actually just sounded sort of cluttered. So much for a career in music. I bought a synthesizer so that I could learn to play Pachelbel's Canon just like George Winston. Oooops. That's a bit more difficult than it sounds. Never did learn to play that silly synthesizer. My favorite guitar is my Guild D-50 six string acoustic. I bought it new in about 1976 and have never had any other guitar that sounds so good or fits my hand so well. Freight Train mp3 - finger-picking... based on the original by Elizabeth Cotton. Creole Belle mp3 - finger-picking... based on Mississippi John Hurt's wonderful song. Hesitation Blues mp3 - flat-pick version... based on the original of Rev. Gary Davis. Sharon, my ex, bought me my first guitar, a Harmony six string, long, long ago. Probably in the late 1960's. I still have it, and play it occasionally. My hometown musical wizard Randy Stockwell recommended it as a good guitar for a beginner, and it certainly has been. 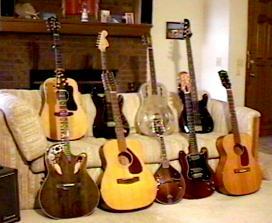 Over the years, I bought several other guitars, mostly to get a new sound so that my same old songs would sound new. Each time I bought a new guitar, it would fool me for a while, and sound like something new. But eventually I would realize that I really just needed to learn some new technique and would go back to my good old Guild D-50. My brain gets too full of tunings and intervals, so I cheat. I restring my mandolin and tune it like a little bitty guitar. I think it was an article by studio musician Tommy Tedesco that gave me the idea. That way, I can find the chords, but that does of course give it a bit of an unusual sound. 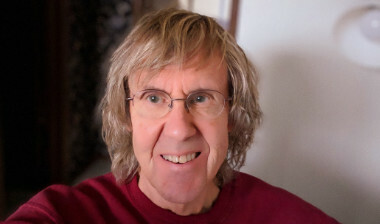 Mostly I play my guitars in standard tuning, although I occasionally play with open G and open E tuning on my six string guitars, and also use open B flat and open C on my 12 string. 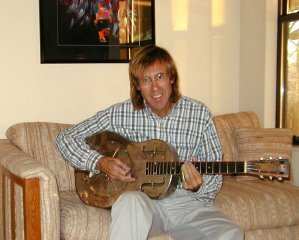 In May 2000 I traded in my beautiful old National steel guitar (serial number S5079 manufactured in 1934) for a shiny new Guild JF-55 12 string. This new Guild JF-55 is simply the sweetest sounding 12 string guitar that I've ever heard... very evenly balanced with full rich jumbo-body bass and bright clear highs. I love it.